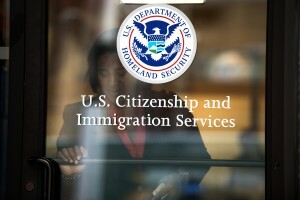 WASHINGTON — More Americans favor than oppose a pathway to citizenship for immigrants who are living in the United States illegally, a new Associated Press-GfK poll shows. While most Republicans oppose such a path to citizenship, it doesn’t seem to be a dealbreaker issue for them. A majority of Americans — 54 percent — support a way for immigrants who are already in the country illegally to become citizens, while 44 percent are opposed. More than 7 in 10 Democrats are in favor, while about 6 in 10 Republicans are opposed. Still, a significant minority of Republicans — 4 in 10 — do support a path to citizenship. Four in 10 conservative Republicans and 3 in 10 tea party Republicans favor a path to citizenship for immigrants already in the country illegally. Six in 10 Americans, including three-quarters of Democrats and nearly half of Republicans, favor providing immigrants who were brought to the country illegally as children with a way to stay in the country legally. The new poll shows that while tough rhetoric on immigration appeals to a majority of Republicans, most still don’t consider it a deal breaker issue. The poll shows that immigration action taken last year by President Barack Obama allowing some immigrants to apply for temporary legal status is a particular sticking point for Republicans, with 73 percent of them saying they prefer to support someone who would undo those immigration steps taken by a president deeply unpopular within their party. But 25 percent of Republicans say they would prefer to vote for a candidate who would keep Obama’s immigration actions in place. And another 34 percent say they could vote for such a candidate even though they disagree on that issue, so long as they see eye to eye on other matters. Even among conservative Republicans, more than half say they either prefer a candidate who would keep the immigration action in place (16 percent) or that they could imagine voting for a presidential candidate who would (40 percent). The poll shows that overall, Americans are split on what they want a 2016 presidential candidate to do about the executive action Obama took last year. Just over half (51 percent) say they’re more likely to support someone who wants to keep that action in place, while 46 percent are more likely to support someone who wants to undo it. Still, 60 percent of Americans disapprove of the way President Barack Obama is handling immigration, while just 38 percent approve. Among Hispanics, a large majority — about three quarters — support a pathway to citizenship for immigrants in the country illegally. Hispanics are far more likely to say they prefer a presidential candidate who would keep the president’s immigration action in place than one who would prefer to undo it, by a 74 percent to 20 percent margin. More than half — 56 percent — say they could not imagine voting for a candidate who wanted to reverse it, even if they agreed on other issues. Americans are slightly more likely than they were two months ago to see immigration as a very or extremely important issue, with 61 percent saying so now after 57 percent said so in October. Republicans are more likely than Democrats to consider it an important issue, 76 percent to 51 percent. Neither party emerges as the clear winner on who Americans trust more to handle the issue. Twenty-nine percent say they trust the Democratic Party to do a better job and 27 percent trust the Republican Party more, while 31 percent say they trust neither party on handling immigration. The AP-GfK Poll of 1,007 adults was conducted online Dec. 3-7, using a sample drawn from GfK’s probability-based KnowledgePanel, which is designed to be representative of the U.S. population. The margin of sampling error for all respondents is plus or minus 3.4 percentage points.